Yulia Kuznetsova. Photo by Peter Bella. In a tough atmosphere for immigrants in this country, Moscow native and 24-year-old artist, Yulia Kuznetsova is fighting for an O-1B visa, only given to those with extraordinary skill and recognition in the arts, to remain in the United States and continue painting content that is unaccepted in Russia. Kuznetsova said she fears some of her more representational and abstract work will not be accepted in Russia’s classical driven art scene and that she must remain in the United States to have a successful career painting what she enjoys. The O-1B visa is a less common visa which grants recipients applicants with extraordinary ability and recognition in the arts a maximum three year stay in the United States. 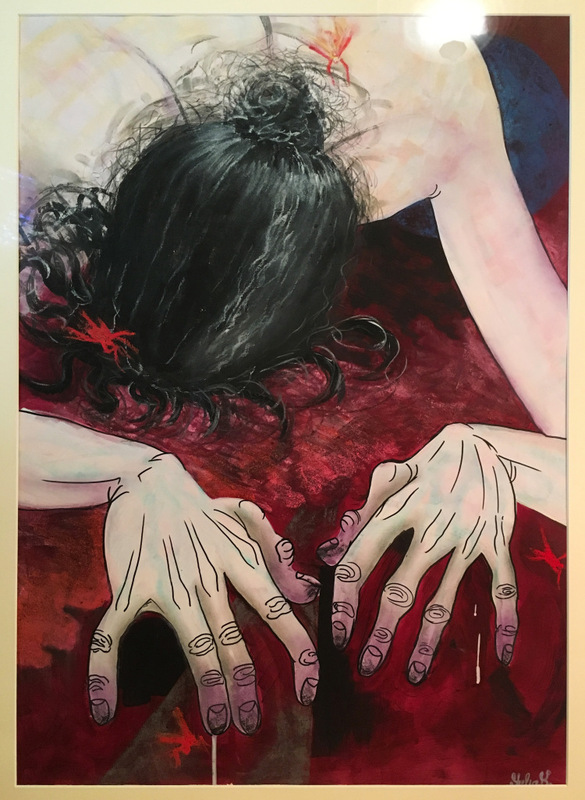 “Sorrow”, pastel, tempera, markers on paper, 28″ x 19,5″, 2016. For her case, Kuznetsova and her legal team will present a collection of letters of recommendation, listings of notable events she has participated in, esteemed groups she has worked for in the past and more to the United States Citizen and Immigration Services Department. Fiona McEntee, Kuznetsova’s lawyer as well as Founding & Managing Attorney of McEntee Law Group said she and her team are building Kuznetsova’s case and estimate they will be ready to present in to USCIS within the next month or two. 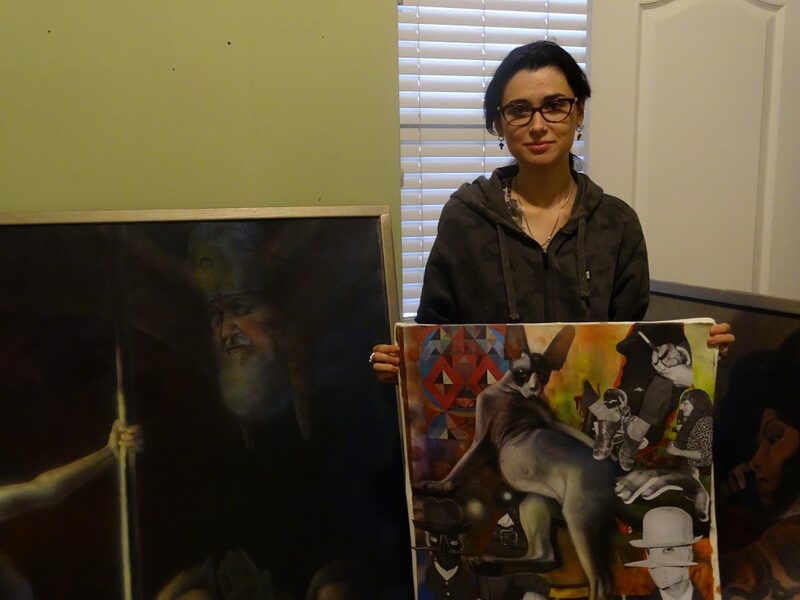 Moscow native and artist, Yulia Kuznetsova is currently building a case to continue her stay in America through a O-1B visa, now that her student visa has expired. 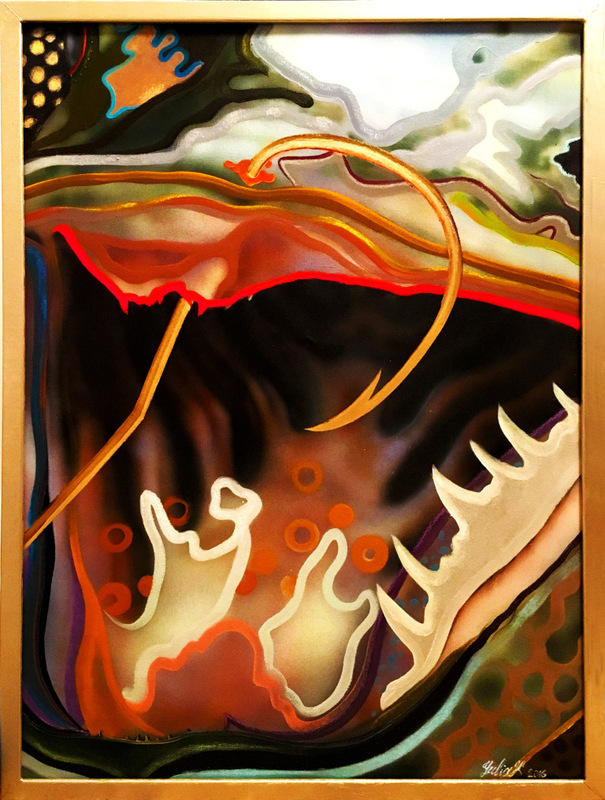 (left)“Eternal Show”; 68″ x 54″, oil on canvas, 2016. (in her arms)“Untitled”, oil, photo collage, air brush on canvas, 2016. Photo by Connor Carynski. McEntee said she was unable to comment on Kuznetsova’s chances of receiving the visa because the decision partially subjective and even if she were presenting what she considered a very strong case, an immigration officer could think otherwise. The case will only take two weeks to process and will either be accepted or more evidence will be requested, giving Kuznetsova and McEntee another opportunity to qualify for the visa. Kuznetsova said it is stressful not knowing if she will be allowed to stay in the United States and isn’t sure what she will do if she is forced to return to Russia. Sometimes she is often afraid to ask McEntee about the likelihood of her visa being approved because she fears a hearing the answer, she added. 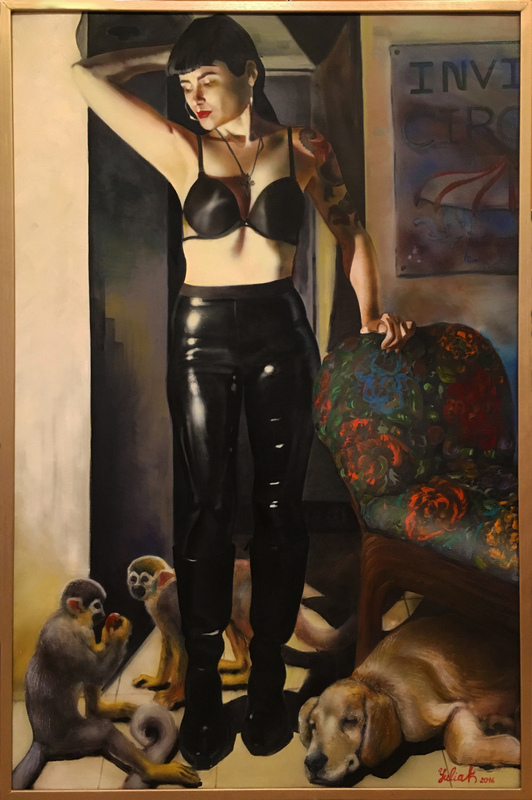 “Her” (version 1), oil on canvas; 74″x 54″, 2014. Kuznetsova first began studying art in grade school by enrolling in a secondary school outside of her primary education, and also attended classes with a private tutor. She said throughout her art education in Russia she was taught to abide by academic standards and was not given many opportunities to branch out from what was being taught. Kuznetsova said her private instructor, although very talented, would never break outside the rules of traditional art. The instructor focused on realism and painted as though every brushstroke had to abide by strict rules, and any other sort of art was dismissed, she added. Kuznetsova said she never wasted time arguing in Russia that there was more to art than what was defined in neat structures and used the opportunity to learn the fundamentals of art before drawing outside the lines and developing her own style. When the time came for her to start looking at colleges, Kuznetsova made the decision to go to the United States. Part of that desire for America spawned from her two parents, who she said have almost idealist thoughts about life in America. Kuznetsova said she remembers her mother telling her that she used to try and pick up American radio waves, even though doing so was illegal at the time. And her father is an avid movie collector and regardless of his limited use of English, purchases almost strictly American films. “Fishing”, oil and acrylic on canvas, 31″ x 41″, 2016. Kuznetsova’s parents agreed to help fund her tuition in America and decided to sell their flat in Moscow and move in with a relative to help cover the costs. After applying to a number of colleges, she said the School of the Art Institute of Chicago was the first school to accept her application and offer scholarships. Although the scholarships helped reduce the cost of tuition Kuznetsova said she and her family paid nearly everything they had for her education. It was through SAIC that Kuznetsova met Mary Lou Zelanzy, a recognized Chicago painter and adjunct faculty member at the college. Recognizing Kuznetsova’s ability as an artist, Zelanzy introduced her to Chicago based artist Tony Fitzpatrick, who later became her employer and sponsor for the O-1B visa. Fitzpatrick said when Zelany introduced him to Kuznetsova he wasn’t looking for employees but after seeing some of her work immediately hired her as a studio assistant where she continues to work. 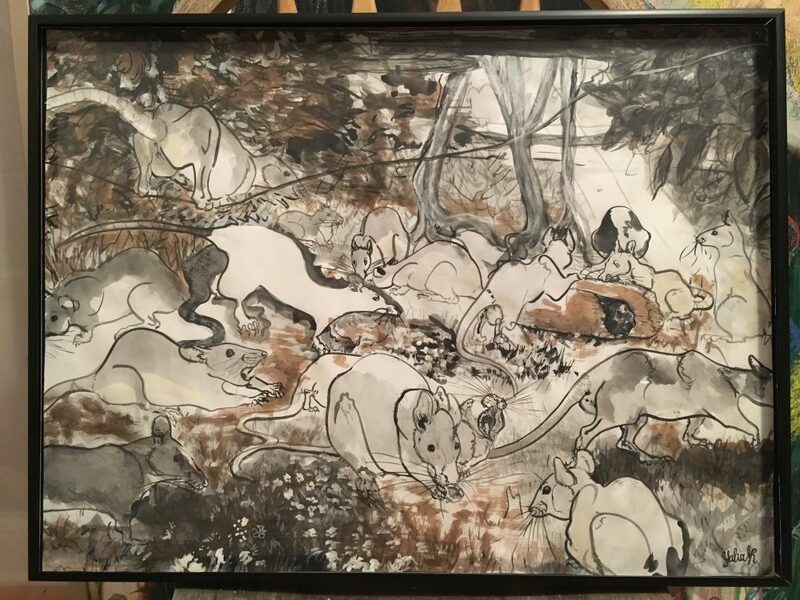 “Rat Garden”, watercolor, ink on paper, 18″ x 24″, 2017. Fitzpatrick said although he is worried about the national attitude of immigrants in the United States, he is confident in the work Kuznetsova has done during her time here. “Invisible Circus”: oil on canvas, 73″ x 49″, 2016. McEntee said she has noticed changes in the ways immigrants are managed by the government throughout the country and that in some cases it had become more difficult to legally represent them. A Dublin, Ireland immigrant herself, McEntee said she can identify with the strenuous process of applying for citizenship and that she felt particularly emotional when hearing Kuznetsova’s case during their first consultation. Kuznetsova said she refuses to stop painting what she wants and that people in Russia don’t always want to look at aspects of their own lives that are unpleasant, meaning if she were to return it would make it difficult for her to put on shows or sell her work at all. I’ve had the pleasure of getting to know Yulia, not only is she a wonderful and talented artist but a true loving and compassionate individual. I can’t believe the struggle she has to endure dealing with this process. Yulia left Russia, America is Yulia’s home. I can’t think of anyone more deserving. I hope you stay in good spirit Yulia!